He woke up crying at 4:30 a.m.
No, please no, I begged. It’s simply too early. I let him cry for a few minutes, but he stood up in his crib. He didn’t like that answer. He started screaming and tried to climb out his crib. I went into his room and laid beside him. “Turn the sheep sleep on,” he said. I turned on his sleep sheep on (the best gift ever, McBride family), and grabbed his hand. But laying on the floor was uncomfortable and I wanted the warmth of our bed. So he came into the bedroom with me and we snuggled up closely. “Hi mommy!” he said, smiling. I could see his bright eyes, wide open. I kissed his little forehead and smiled back. He really is the kid version of Buddy the Elf. Eventually he went to sleep. He stayed cuddle up in my arm-pit for three more hours. Thank goodness. When my alarm clock went off, I didn’t want to wake him up. I didn’t want to let go of that moment. I could see his sweet lips puckered together. His chest taking deep breaths. My love for him consumed every piece of my soul in that moment. Eventually, I moved and that woke him up. “Are you ready for your first day of school?” I asked. “YEAH!” he said and tried to jump off the bed. “Wanna go downstairs,” he said. We got ready and I was in complete denial of this new chapter. I had to run the trash out to the curb before we left. Well, that’s true; I laughed at his attitude. We drove to his new school and I kept asking him questions and tried to pump him up about the day. To be honest, I think I was doing that for me too. We got into the parking lot and I could see him get a little nervous. 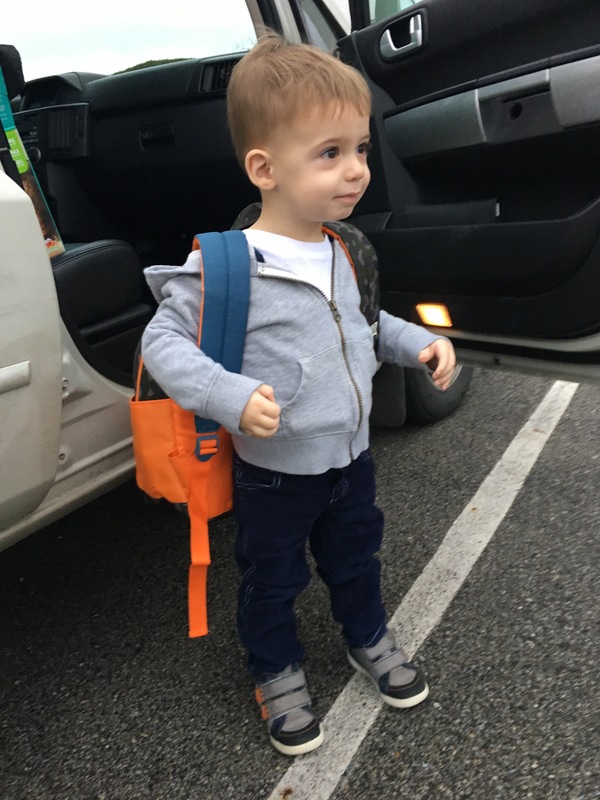 I pulled him out of the car and asked if he wanted to put on his backpack. 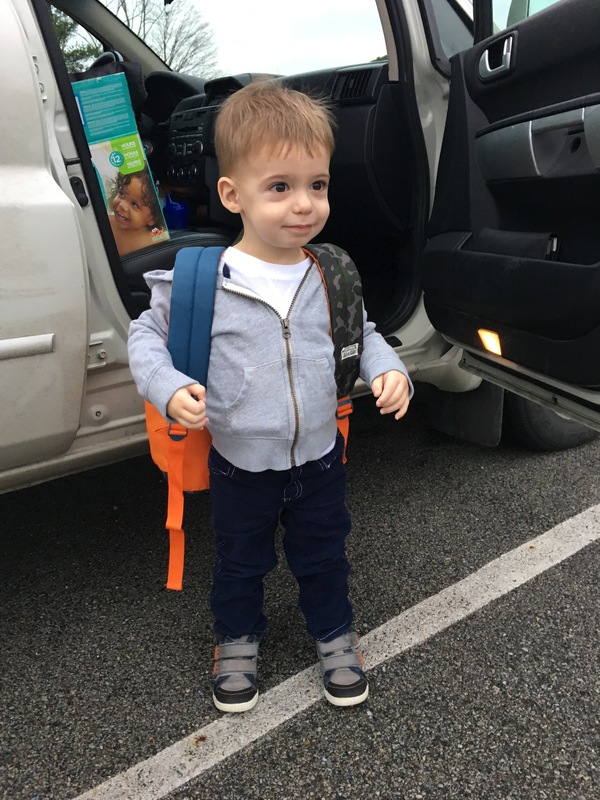 The face he made when I put on his backpack was PRICELESS. It’s WAY too big for him, but I went for 6 different stores searching for a backpack. And this is the best I could get since backpacks aren’t in season right now. We walked up to the door and he began to get nervous. “Hi Cooper,” Mrs. Christy said with a giant smile on her face. Mr. Buddy the Elf himself kept calling her “Christmas Tree” on the way to school. I laughed so hard. Cooper didn’t say anything.. He walked in confidently, but reached behind for my hand. I followed him inside and we hung up with backpack and coat. A few kids came to greet Cooper. One little boy was so eager to play. Cooper walked toward him and then turned back. “Mommmmmy!” He said and hugged me. He took a few steps away and soaked everything in. I made small talk with his teacher, but don’t recall the details. I was too busy praying for a smooth day….for us both. But I kept my cool. 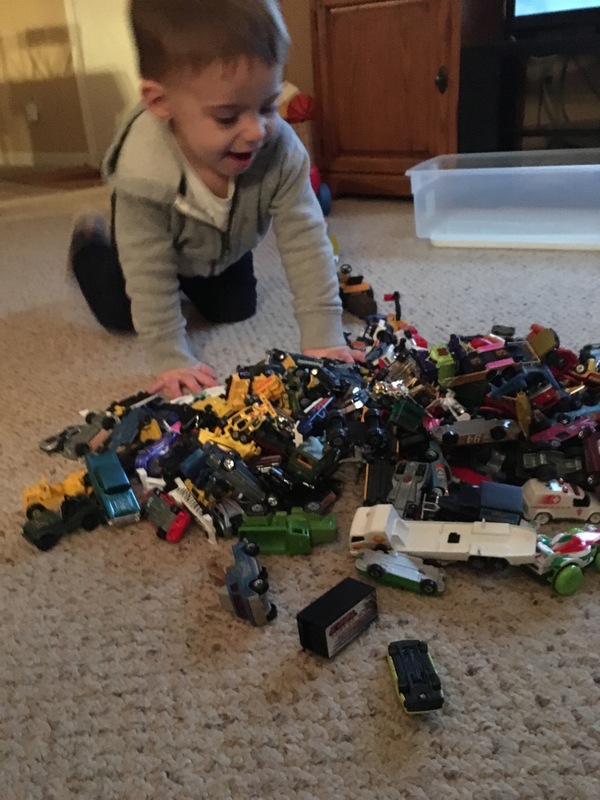 He isn’t supposed to take in toys, but Cooper loves matchbox cars and chapstick. I let him sneak in a chapstick, but he pulled it out in front of the teacher. Next time keep it in your pocket, kid – I said through my mental message to him. I eventually slipped out and felt like I was leaving my heart inside. I waited about an hour before checking in on him. My heart broke, but I remained positive. He’ll do better. I’ll do better. As I was leaving the gym, an older woman who volunteered at the gym made small talk with me. I told her we recently moved here. I’ve actually heard a few people say this now. I grew up in a small town. Smaller than Richmond, actually. So if I’m being completely honest, what has shocked me the most is how much I love it here. I love how friendly and welcoming everyone is in this city. I love how small businesses keep the city running. I love how people say hello everywhere you go. I love how neighbors and people walking down the street notice you and make eye contact. I love how the community gives to those in need. Tonight I teared up as I drove past a ministry that was giving dinner to those in need. I saw a man walking toward the building as I drove by. He must have caught me starring at the amazing gesture and crowd, so I smiled. He nodded back at me and he returned a smile. Isn’t it incredible how powerful one smile can be? (You saw that coming, didn’t you)? I love how Cooper’s face lights up when he recognizes familiar streets and people. When I picked Cooper up, he ran over and gave me the biggest hug. He was happy and so were his teachers. From morning snuggles to new beginnings to lots of laugh; today was great. “And who else?” he asked.